Forward-thinking architects are developing designs that maximize usable area, provide versatility, and create high-quality long-lasting buildings using structural steel systems. Structural steel framing has recognized benefits in apartment and condominium design, effectively addressing the challenges of limited program space, speed of construction and future adaptability to changing needs. It is an ideal solution for mid-rise and high-rise structures where economy can be gained through repetition of the structural members. The most successful projects are a result of a collaborative team effort. As the building structure is always on the critical path, the benefit of designing with structural steel is a reduced overall construction schedule with effective planning. More usable space. Longer spans and smaller columns allow for more usable floor area and fewer structural intrusions in open spaces. Two key selling factors in apartments and condominiums are open views and maximum free space. 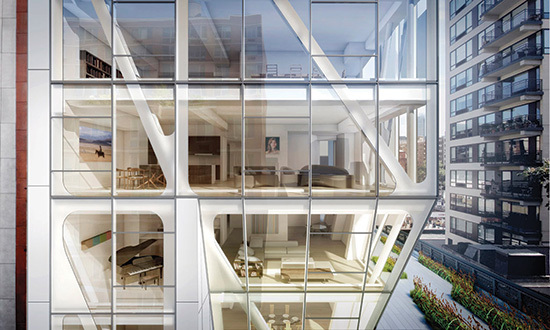 For example, in a 10-story residential building with 30-foot structural bays, 13 inch by 13 inch steel columns would translate to approximately 18 inch by 18 inch concrete columns for the equivalent loads. Steel columns have a reduced structural footprint compared to concrete, allowing for the greatest flexibility in furniture layout and more unobstructed views. Fast erection and assembly. Structural steel is fabricated and erected in nearly all weather conditions with no formwork requirements, which significantly reduces the time for construction. An excellent choice for fast-track construction, structural steel framing meets owner needs to bring apartments and condominiums to market on time. A shorter schedule allows owners to reduce financing costs and generate revenue earlier. Durable and long-lasting. The combination of a high-strength, low-weight material and resistance to rot and insects are prime elements contributing to the durability of structural steel. Apartment and condominium buildings utilizing structural steel framing inherently have a long life span due to the long-term performance of the material. Structural steel can be recaptured from demolition sites and reused multiple times prior to being recycled. The framing components may be disassembled and salvaged, a cleaner process than the demolition of concrete buildings which leads to more dust and pollution in the air. Versatile. Structural steel framing handles changes to load and occupancy requirements with ease, extending the functional life of buildings. Additional reinforcement is simple and straightforward with steel and can be designed to support changes of use, increased loads, additional floors, and longer spans. 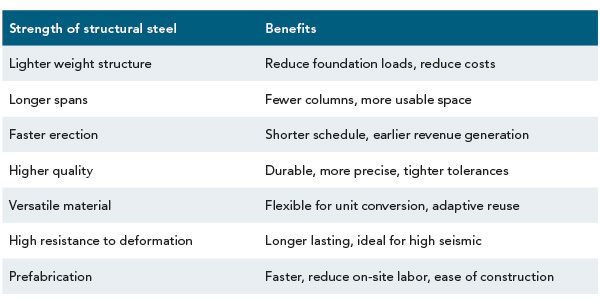 An ideal system for unit conversion or adaptive reuse, the versatility of structural steel highlights the benefits for apartment and condominium designs. Aesthetic options. Structural steel offers a wide range of shapes and sizes that allow a multitude of options for building cladding and expression. Recognized for its slenderness and grace, steel can be shaped into tight curves and broad arches, and utilized for long cantilevers. Steel may be exposed architecturally and should be protected from fire and corrosion where required. Methods of fire protection range from intumescent coating to cementitious spray-proofing, while design for corrosion includes options such as galvanizing or painting depending on the exposed condition. Strong seismic performance. A ductile material such as steel is excellent for high-density residential buildings in seismic zones, where safety is critical for large numbers of occupants. Structural steel systems offer the highest level of safety in seismic design. 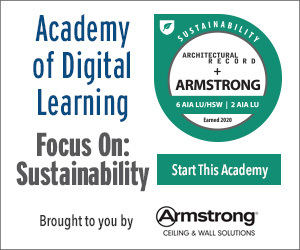 Seismic design is required in approximately half of the geographic area of the United States. The lightweight nature of steel reduces the seismic base shear by about one-third compared to an all-concrete structure, which results in a significant reduction in foundation loads.